King Conan: The Conqueror #1 opens with a glorious summary of the events of the preceding miniseries, King Conan: The Hour Of The Dragon. Most readers probably won't need such a summary. If they are anything like me, they have been eagerly awaiting this latest adaptation from Truman, Giorello and Villarrubia for a while now. Still, the summary offers a welcome reminder and should prove a boon to any new readers who choose to jump into the story at this point. Truman's script sticks firmly to the original text by Robert E. Howard. 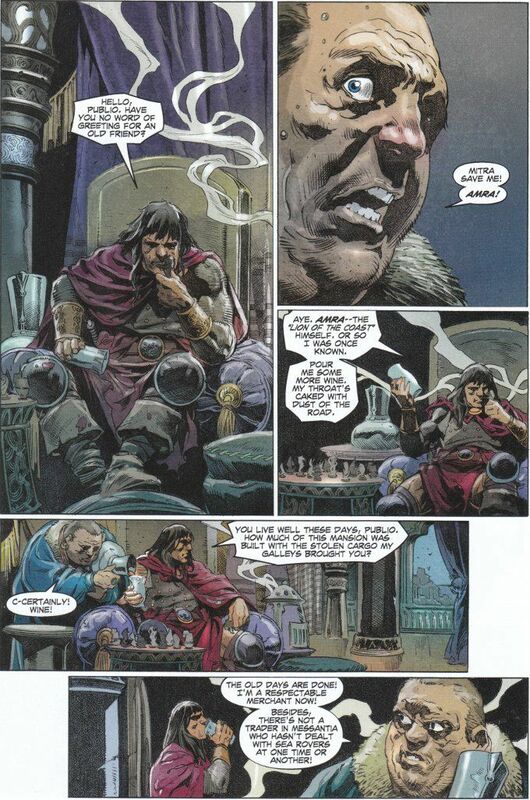 Truman's sole expansion upon the original story is a framing device, in which an aged King Conan relates a tale of how he reclaimed his kingdom to a young scribe. Truman does add one interesting wrinkle to the tale - the idea that Conan and his beloved queen Zeonbia were never formally wed. Conan's reasons for this, however, are true to character and the revelation, while interesting, is inconsequential to the action at hand. And what action! Disposed from his throne by an evil wizard in the service of an enemy nation, Conan now seeks The Heart of Ahriman - a magic gem used by his enemies to resurrect and command said wizard. Conan has tracked said gem and the thief who stole it to the port city of Messatina. It is here he hopes to reconnect with old contacts from his days as a pirate and recover the gem before the thief can find a buyer. Moody and morose, Tomas Giorello's artwork is a perfect complement to Truman's script. Giorello is one of the finest sword-and-sorcery artists in the business today and his Conan is quickly becoming the definitive modern version. His artwork is aided by some masterful choices of color by Jose Villarrubia, whose muted palette aids to the feeling of gloom and desperation that dominates Conan's current attitude and plight.